Figure 1 Schematic representation of PTKs in T-cell antigen receptor function. 1 = SH1, 2=SH2, 3 = SH3, 4 = SH4, PH=pleckstrin homology, TH=Tec homology, YP=phosphorylated tyrosine, PTP=protein tyrosine phosphatase domains, ITAM=immunoreceptor tyrosine-based activation motif. 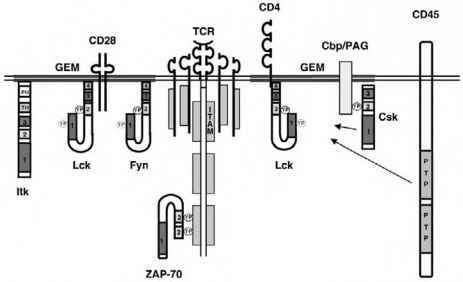 found associated with the TCR subunits and Lck is non-covalently associated with the CD4 and CD8 coreceptors that colocalize with the antigen receptor upon receptor engagement [14-17]. How the basal phosphorylation of the TCR ITAMs is controlled remains unclear, but undoubtedly represents a net balance of continued phosphorylation, dephosphorylation, and internalization of antigen receptors. Similar to other Src PTKs, Lck and Fyn contain four structural domains (SH1, SH2, SH3, and SH4) [18,19]. The SH4 domain encodes the amino (N)-terminal 15 amino acids and facilitates the subcellular localization of the kinase through post- and cotranslational modifications that include myristoylation and palmitoylation [20-22]. These modifications preferentially localize Lck and Fyn into subspe-cialized domains within the plasma membrane referred to as glycolipid enriched microdomains (GEMs) [23,24]. These microdomains differ in their cholesterol and phospholipid content which results in differences in the lateral mobility of proteins that reside within GEM and non-GEM fractions. In addition, the association of Lck with the CD4 and CD8 coreceptors that are also enriched within the GEMs further preferentially localizes Lck within these microdomains. T cells that express mutants of Lck that cannot localize into the GEMs are unable to initiate TCR activation events [25,26]. Hence, proper subcellular localization of the Src PTKs, through the SH4 domain, is requisite for TCR functions. Carboxy (C)-terminal to the SH4 domain are the SH3 and SH2 modules, which bind a variety of signaling proteins to mediate the assembly of signaling complexes as well as to regulate SH1 (kinase) domain enzymatic activity. Determining the structures of the Src family PTKs has provided major insights into their regulation [27,28]. 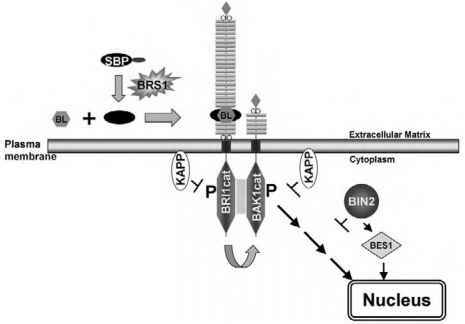 First, a greater understanding of how phosphorylation of the activating autocatalytic and inhibitory C-terminal tyrosine residues regulates kinase activity has been established. Phosphorylation of the C-terminal tyrosine residue (Tyr 505 in Lck and Tyr 527 in Fyn) by Csk (c-Src kinase) downreg-ulates Lck and Fyn activity by promoting an intramolecular interaction with its SH2 domain. This intramolecular binding event favors a "closed, less active" conformation by altering substrate accessibility into the catalytic pocket. Conversely, dephosphorylation of the C-terminal tyrosine residue by the CD45 protein tyrosine phosphatase disengages the inhibitory conformation and permits greater substrate access to the enzymatic core. The SH3 and SH2 domains further contribute to the effect of the C-terminal inhibitory tyrosine by stabilizing the closed conformation with tail phosphorylation . Second, an additional role for the SH3 domain of Src PTKs in regulating Src PTK function has been demonstrated . Binding of a high-affinity SH3-binding peptide or the HIV-Nef viral protein contributes to Hck (another Src family PTK) activation. Recently, SH3-binding peptides derived from the cytoplasmic domain of CD28 have been shown to be capable of activating Lck and Fyn PTKs . Moreover, mutation of the corresponding proline residues within this motif results in loss of CD28-mediated corecep-tor functions. Finally, the mode of lymphocyte activation can also affect the activation status of Lck. While crosslinking of the TCR with anti-CD3 monoclonal antibodies is unable to induce Lck autophosphorylation on Tyr 394, crosslinking of CD4 or CD28 coreceptors alone can induce Lck autophosphorylation . As each of these structural domains contributes to Src PTK activation, receptor and coreceptor engagement likely contributes to maximal Lck functional activity through distinct mechanisms involving relocalization within membrane subdomains as well as direct enzymatic activation.